Find article about how to invest in small growth ETFs. This small growth stock exchange trade funds provide high risk and high reward opportunities for investors. For growth seeker investors, small growth funds provide a right risk and reward. These small growth funds utilize their assets to purchase stocks of small size companies with high growth potential. These companies are fast growing and often richly valued. The stocks may be volatile and easily swing up/down. Exchange traded funds or ETFs are used by investors to seek investing in this small growth stocks. Investor can buy or sell the ETFs through your brokerage. These ETFs are traded like stocks through variety of stock exchange/market such as NASDAQ, NYSE, or AMEX. 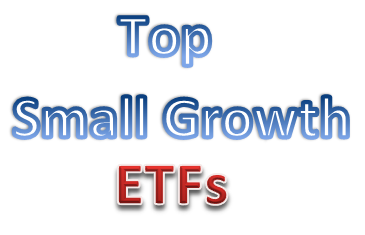 Most of the small growth ETFs are index ETFs (i.e. passively managed & tracking their benchmark). From this best performing funds list, you may find each individual fund review. You can find the fund performance, expense ratio, and yield or dividend from the table below. The list is sorted based on its 1 year total return up to May 19, 2014. Ranked with 4 stars rating, this Guggenheim S&P SmallCap 600 Pure Growth ETF has a 1 year total return of 16.81%. This index ETF is tracking S&P SmallCap 600 Pure Growth Index. The current share price is $74.26. This exchange traded fund has an expense ratio fee of 0.35%. This top small growth ETF has returned 13.25% over the past 3 year, and 21.99% over the past 5 year. The total net assets are $107 million. Top 3 sectors are financials, information technology, and health care. 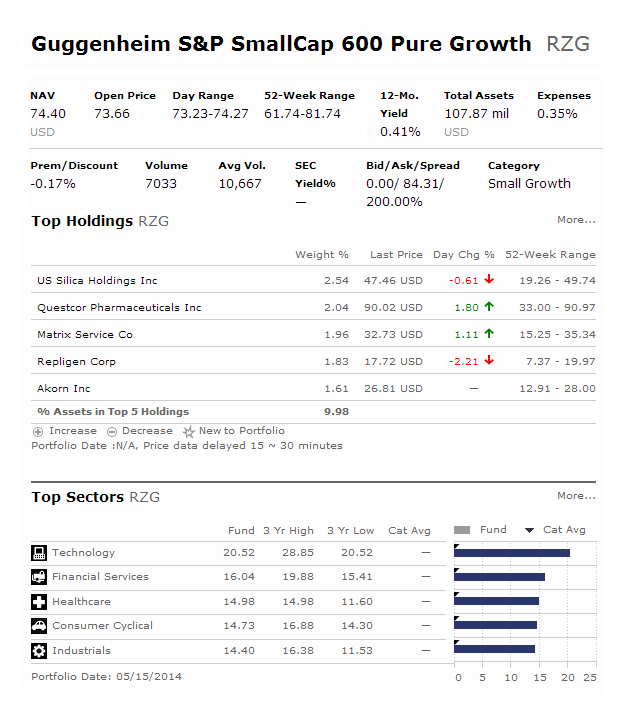 Top 4 stocks in its portfolio are US Silica Holding, Questcor Pharmaceuticals, Matrix Service Co, and Repligen Corp.
SPDR S&P 600 Small Cap Growth ETF is another index exchange traded fund. The current dividend yield is 0.68%. This ETF holds about 362 stocks. It is trading at NYSE Arca Exchange. This fund has a weighted average market cap of 1.8 billion. Morningstar has ranked this best fund with 5 stars rating. This small growth ETF has a 52 week range price of $141.20 & 184.53. For the past 1 year, it has returned 15.24%. Top 5 stocks in its holdings are Questcor Pharmaceuticals Inc, Enersys, Belden Inc, West Pharmaceutical Services Inc, and MAXIMUS Inc.
iShares S&P Small-Cap 600 Growth is a 4 star ETF. This ETF provides exposure to small public U.S. companies whose earnings are expected to grow at an above-average rate relative to the market. With total net assets of $2.6 billion, this fund has expense ratio fee of 0.26%. Vanguard S&P Small-Cap 600 Growth Index ETF is the smallest ETF among this list. With $54 million of assets, this top small growth ETF has the lowest expense fee of 0.20%. The current SEC yield is 0.63%. It has a share price of $95.79. This Vanguard ETF is ranked with 5 stars rating by Morningstar. It has a 3 year average return of 12.92%. 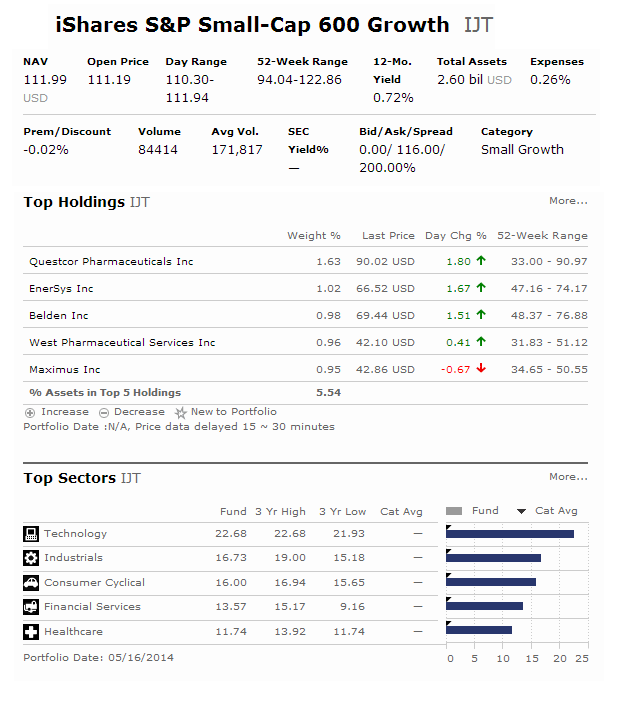 Top 2 sectors in its holdings are technology, and industrials.